As the temperatures drop and the holidays approach, there’s no better time to plan a festive getaway to Maryland’s Eastern Shore. From art festivalsand joyous holiday celebrations, there’s plenty of fun to experience in Talbot County. We invite you to join us and take part in exploring our winter wonderland at one of the many gatherings in the area. Whether it’s a family trip ora quiet getaway with someone special, you’ll love creating new memories and holiday traditions here. There’s no better place than Talbot County to start a new holiday tradition with your loved ones. You might even spot Santa Claus visiting our area! Kick off the holiday season at Oxford’s Christmas on the Creek December 1-3, 2017, celebrating the area’s history and hospitality with fellowship and caroling at Waters United Methodist Church. The event’s Christmas bazaar, the Treasure Chest holiday sale, and the Oxford Library’s annual gift book sale are the perfect spots to shop local for holiday gifts. And for the little ones, join Santa for the official tree lighting in Oxford Town Park or for a festive breakfast at the Oxford Firehouse. The Oxford Museum will be open daily along with wine and cheese tastings at Pope’s Tavern and the Oxford Market. The Oxford United Methodist Church hosts a homemade soup supper, wreaths, trees and craft sale. And don’t miss the Holiday Tour of Homes on Sunday. On Dec. 1, town of Easton stays open late for Moonlight Madness. In addition to terrific shopping, there will be live entertainment, caroling, and raffle prizes. 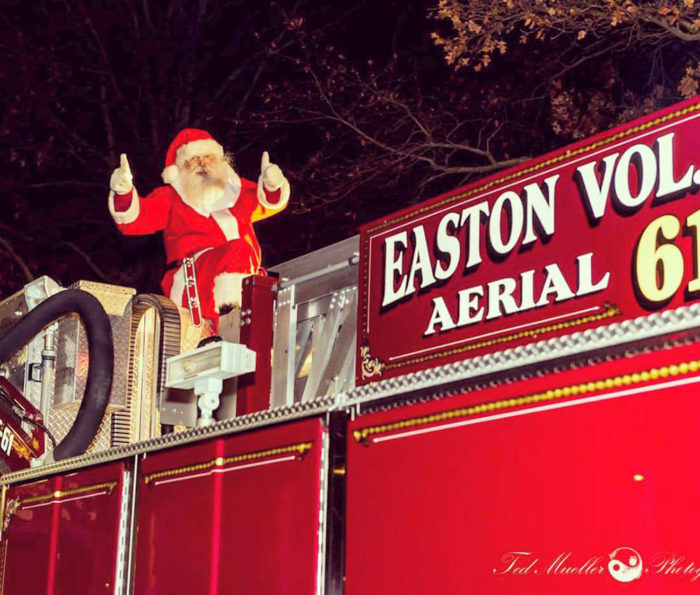 Then Easton’s Holiday Parade, Dec. 2, celebrates the season with local organizations and groups participating in this festive tradition throughout Easton’s historic business district. Before the parade starts, do some holiday shopping at Easton’s new Christmas Artisans’ Market, where you can support local stores by purchasing unique, handmade gifts for your loved ones. Be sure to keep your eye out for Santa; he’ll be there, too, accepting wish lists and posing for family pictures. 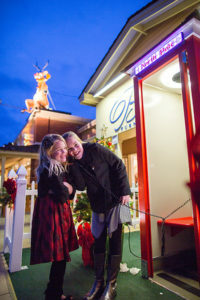 For more than a quarter of a century, the town of St. Michaels has welcomed the holiday season with festivities on the second weekend of December. The Christmas in St. Michaels events welcome Santa and celebrate the joy of giving and the Christmas spirit. From the largest holiday parade on the Eastern Shore to the annual tour of homes, the holiday gala and breakfast with Santa Claus, proceeds from the ticketed events have raised more than one million dollars for local charities. When you visit Christmas in St. Michaels, be sure to purchase this year’s holiday ornament featuring canine retrievers so well known in our area for their hard work with waterfowl hunters. Local artist Joanne Buritsch designed this year’s collectors ornament for the event. The world famous Glenn Miller Orchestra will lift your spirits through music at the Avalon Theatre on Dec. 6. Bring the whole family to enjoy the sounds of original Miller arrangements as well as modern selections performed by the 18-member ensemble. Get your tickets soon before this jazzy sought after semi-holiday show is sold out. Another local tradition the family will love is the annual Great Crab Pot Christmas Tree Lighting and Boat Parade on Tilghman Island, Dec. 9. Local watermen and residents work together to craft a tree entirely of wire crab pots, used in the summer to catch Chesapeake Bay blue crabs. The holiday festivities take place at Phillips Wharf Environmental Center with a cocktail reception at The Bridge Restaurant. After sipping on a holiday drink, make your way over to meet Santa Claus and enjoy cookies and hot cocoa along the waterfront for the tree-lighting ceremony and the popular lighted boat parade. Take part in the local arts scene as the Avalon Foundation presents a revised version of ‘The Christmas Carol’ on December 15-17 and 20-22. Enjoy the retelling of Charles Dickens’ classic story and be reminded of the true importance of the holiday season. Ticket proceeds benefit the Avalon’s year-round mission to provide arts and educational opportunities to the residents along the Eastern Shore. This year’s holiday celebration is sure to be a sell-out, so be sure to book tickets in advanced. Experience a winter wonderland retreat when you make plans to visit Talbot County this fall. From holiday festivities to food and parades, gather your friends and family to create everlasting memories this winter. Find a place to stay and get ready for a great vacation in Talbot County!